DO the 1/1/1/1. Make Your New Year Really Count! Join me and DO the 1/1/1/1. Even if you are a procastinator like me, and miss making a commitment on January 1st , yet again. Even if you see this on 1/8/11 or in March or November or 12/31/11, you and I can continue our 1/1 New Year hopes by celebrating how we give and receive any of the other days of the year! Yup, the 1/1/1/1 isn't just for January 1. In any given year "one" is a step, a beginning. "One" can also, of course, be the sum of an entirety. In mythologies 11/11 is symbolic of the opening of gates, of opportunity, and for making change. 2011 gives us a special, fun reminder of the symbol of "one's" beginnings and unities. Every glimpse at the "11 calendar this year helps us remember that we can commit to a new "one" right now, this second.. or later. Sometimes it's a "just do it" and sometimes it's OK to "let it wait" or be "in process." So, DOing the 1/1/1/1 is what you choose it to be. DayOne365-- a 14 year-old project that has evolved in its own rather slow pace-- is really just about Celebration. Like many resolutions, it was birthed for the New Year, and its evolution is slow. From our perspective this year's 1/1/1/1 wonderfully encapsulates the invitation of DO365. You can DO it a little everyday, or just once this year. Start it and stop it. It's OK to pick it up, revevaluate after it failed. Remember to have fun with whatever you do, while you do it! I'm off to splash in the winter ocean today. It's a huge coming home to the place and time that I got the urge to "just do it." 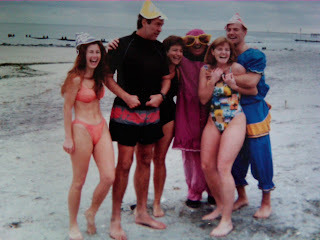 With the help of five others, lots of work, and the efforts of some pretty wonderful people over the years, that spontaneous moment in 1997 is now a community event enjoyed by over 5,000 spectators and about 700 ocean plungers! We do it for charitable reasons and we do it to replenish ourselves. I've not taken the plunge since 2000. It's a good day to give it a go, again. Join me. Take a plunge in whatever is important to you this year. Let's help each other make our New Year really count. 1/1/1/1 full splash ahead! Day One 365.org (DO 365org) --January 1 through December 31, 2011-- is about celebrating your volunteerism, addressing the benefits and real barriers to helping others, understanding that you, too, might sometimes be in need, and encouraging Nationwide Volunteerism Sign Up Day opportunites on 12/31, 1/1, July 4th and Labor Day at new and existing parades, sporting venues and festivals. Building Community together is a true celebration. Party On!